Perhaps the most beloved of all the seasons, there's not much that beats the sweet smell of summer! Temperatures soar, days get longer and glorious weather is pretty much a guarantee. What's not to love? Whether you're after Blue Flag beaches, a romantic getaway or family fun in the sun – there's a holiday home from home with your name on it. Fly and flop to the beautiful Balearic shores, or gorge yourself on Greek gastronomy. With villas handpicked for their heavenly locations, unrivalled privacy and first-class facilities, 2020 summer holidays are shaping up to be your best yet! Picture it now – perfect days spent lounging by your own private pool, balmy evenings dining al fresco under a starry sky and complete freedom to holiday the way you want. The early bird catches the worm when it comes to summer 2020. Plan ahead and secure your villa and flights for blissful 7, 10 and 14 night breaks. After all, who doesn't love a good old fashioned holiday countdown? Summer holidays and the Greek islands go together like sunglasses and sunshine. Blessed with piercing blue skies and stunning turquoise seas, you'll find one gorgeous golden day simply melts into the next. White-washed fishing villages line sleepy shores, while ancient landscapes and crumbling ruins are scattered across island interiors. Balmy evenings and sunsets make a perfect pairing, much like a trip to the traditional taverna, where you can devour mouthwatering meze and sip on local wines. Ionian icon Kefalonia invites you to lose yourself on its blissful Blue Flag beaches and wild mountainous landscapes. The setting for blockbuster Captain Corelli's Mandolin, if it's good enough for Hollywood – then it's good enough for us! Carpeted in green hills and lush vegetation, nature lovers will fall head over heels for the wild beauty all around. North of Kefalonia lies lovely Lefkas, where dramatic white cliffs dominate the landscape. Hop aboard one of the many boat trips and explore the neighbouring islands too! Mind-blowing natural beauty is the name of the game for Greece's infamous islands, and Zakynthos is going for gold! Limestone cliffs plunge into perfect waters, and just like that the rugged west coast steals the show. Here you'll find the notorious Navagio Beach, one of the most photographed places of all time. Only accessible by sea, take a boat tour and get up close and personal with the stunning shipwreck. Watch in awe as impossible tones of turquoise glisten under the Greek sun, the water colour is almost too good to be true! From pin-drop peaceful bays to buzzing nightlife, there's something for everyone on Zakynthos. To the east of Mainland Greece you'll find even more pieces of paradise. The Aegean Sea plays host to approximately 1,400 islands and islets dotted across its dazzling surface. Captivating Crete lies at one of the most southerly points. Sun-drenched and seductive, the island is Greece's largest. Boasting rugged canyons, vibrant cities, sleepy villages, bewitching beaches and even snow-capped mountains (at certain times of the year). It's even home to Europe's longest gorge! This is most definitely the place to be if you enjoy a taste of the great outdoors. Spectacular Santorini is synonymous with Greece and its islands. The prized postcard destination sits on most people's bucket lists, and with good reason! 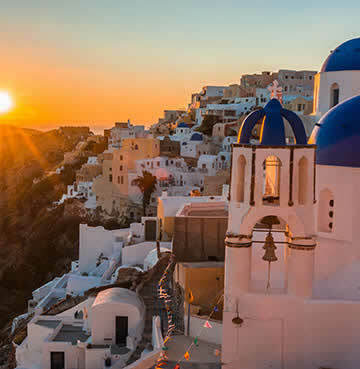 Between the blue domed churches of Oia, jaw-dropping volcanic beaches, craggy clifftop villages and some of the world's most spellbinding sunsets – there's not a bad view in the house! A once in a lifetime luxury escape, in Santorini you'll find a romantic retreat like no other. Set your summer sizzling with sensational highs of 30°C and over. If your dream summer holiday revolves around low-key, laidback living, then look no further than Greece's mythical mainland. Outrageously underrated, the luscious land mass is Mediterranean magic at its most marvellous. Dotted with unique UNESCO World Heritage Sites and age-old archaeological areas – history hunters are in for a real treat! Almost exactly as nature intended, it'd be a Greek tragedy to miss out on the mainland's hidden secrets. Peloponnese and its expansive peninsula are a honeypot for cultural treasures. From the famous canal at Corinth to the ancient cities of Sparta and Olympia, step back in time and walk in the footsteps of the gods. Medieval monuments, fantastic fortresses and Byzantine churches sit against towering mountains and rugged rural regions. Off-the-beaten track beach beauties are waiting to be uncovered, with secret coves sheltered by forests and rocky headlands. 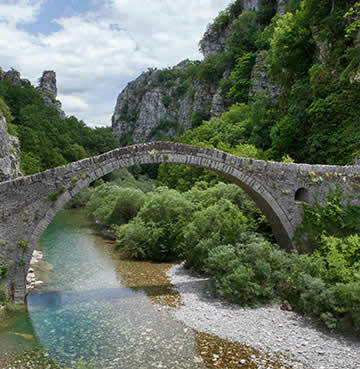 Mother Nature has been kind to Peloponnese's northern friend, Epirus. Not only is the area blessed with charming seaside scenery, it's endowed with mountains, rivers, plains and verdant valleys. Untouched and unspoiled, nature lovers won't know where to begin when it comes to exploring Epirus. With every kind of outdoor activity at your disposal, a summer holiday here is all about adventure! Embrace the wild with mountain climbing, hiking, skiing, kayaking, cycling and good old fashioned road trips. 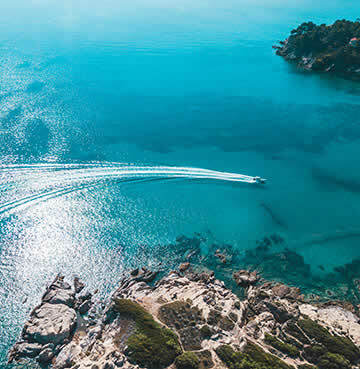 Heavenly Halkidiki and its alluring three pronged peninsulas are lined with more than 50 Blue Flag beaches. 310 miles of powder-white sands sprawl out into the Aegean Sea. Affectionately referred to as the 'Three Fingers', it has similarities to Poseidon's infamous trident too (if not a little upside down). Equally as exotic as some of the nearby islands, savour every second of the striking scenery under the hot summer sun. Last but most certainly not least, tuck in to a slice of traditional Greek life on the Olympus Riviera. Nestled at the foot of Greece's highest mountain, Olympus, 70km of continuous coastline sprawl out amongst fragrant pines. If summer temperatures can get a little too hot for your tastes – then the Olympus Riviera read your mind. Thanks to its proximity to Mount Olympus it never over heats, although the crystal-clear waters are beautifully warm for swimming. It's no real surprise that the Greek gods chose this address for their permeant residence! Much like the islands, Greece's mainland means business in the summer! Climes climb well into the 30°Cs. A heart-shaped slice of holiday heaven – Istria is villa escapism at its finest. The picture-perfect peninsula is a collection of craggy coves, rolling countryside and all-over breathtaking natural beauty. 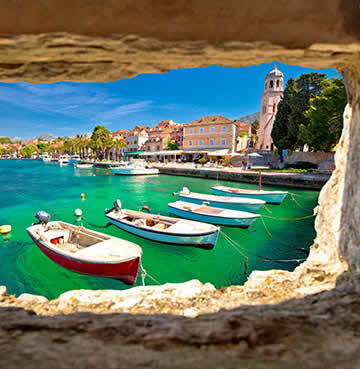 Crafted from old stone, Istria's iconic hilltop hamlets and coastal resorts ooze rustic charm. Venetian-style houses, pretty town squares and baroque beauties pepper the landscape, with Pula, Rovinj and Poreč being amongst some of the greatest hits! Culture vultures will be spoilt for choice when it comes to this historic honeypot. From pristinely preserved old towns to some of the world's finest examples of ancient architecture. 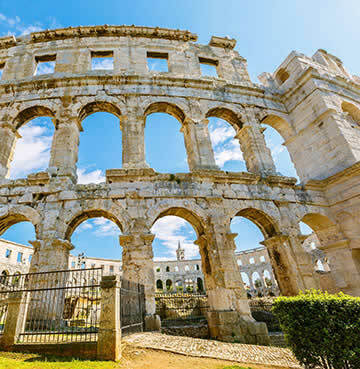 Pula's famous Roman amphitheatre dominates the skyline, and you'd be forgiven for confusing it with Rome's very own Colosseum at first glance. Wander the walls and visit the underground quarters which were once used to cage wild beasts before gladiator fights. The Euphrasian Basilica is another one for the bucket list, not only is it one of Europe's finest examples of Byzantine art, it also has UNESCO's stamp of approval – earning its World Heritage Site status. Glittering mosaics adorn the walls, while intricate carvings are crafted into its columns. Beyond cultural conquests, Istria is irresistible for lovers of the great outdoors. Jam-packed with national parks and natural attractions galore! Boat trip to Brijuni Islands National Park, an amazing archipelago made up of 2 small islands and 12 little islets. Carpeted in ancient pines and olive trees, surrounded by sparkling seas, here you'll find a truly serene scene. Take your discoveries to new depths with Grotta Baredine, a five chamber cave complex that's beautifully decorated with both stalagmites and stalactites. From holiday lows to highs, hike or bike your way to the top of Mount Ucka and savour the spectacular views. Summer Temperatures in Istria are a toasty 26°C and counting. If your getaway has to include a handful of dedicated beach-only days, then Split and Dalmatia should be high on your holiday wish list. Blue Flag beauties line up along the south coast, backed by verdant vegetation and lapped by crystal clear waters. Whether you're after buzzing hotspots or hidden gems, Croatia's got a few tricks up its sleeve when it comes to stunning shorelines. Mesmerising Makarska boasts some of the best beaches on the Dalmatian Riviera. White pebbles meet with impossibly blue waters, against a backdrop of the jaw-droppingly dramatic Biokovo Mountains. The hallmark for most of Markarska's beaches include a shallow incline, fine shingle, trees for shade and invitingly warm waters. Pack a good book, sunhat and your favourite swimwear and set out for a day of uninterrupted relaxation. Just a five minute walk from Split's Old Town, is the hugely popular family beach of Bačvice. A bustling resort, get stuck into a wealth of wonderful watersports, easy-going eateries and walks along palm-tree lined promenades. The traditional Croatian game of Picigin was born at Bačvice, so if you see people batting at a small ball with the palm of their hand and have opportunity to join in – be sure you do! The Dalmatian Islands will fulfil every sand-filled dream on your spade and bucket list. From the 'golden horn' on Brač, to Hvar's gorgeous Grebišće beach – trying to pack them all in is no mean feat! After an exhausting day of sunning yourself, head to one of the islands' historic town harbours and enjoy a balmy evening spent by the waterfront. Watch as fishing boats dance gently on the waves, whilst the sun sinks into the horizon. You've found bona fide summer holiday bliss! You can expect average climes of 27°C across Dalmatia in the summer months. Affectionately known as the 'pearl of the Adriatic', dreamy Dubrovnik is just as swoon worthy in real life as in its pictures. Iconic limestone labyrinths are lined with red-roofed, honey-stoned houses, and the entire city is teeming with cultural wonders. Here lies a real life historic treasure trove of amazing architectural creations, including fortresses, monasteries, palaces and cathedrals. 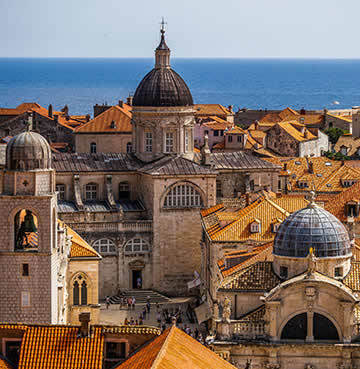 Perhaps most impressive of all are Dubrovnik's infamous walls, which are a must-see! The early bird catches the worm (especially in the summer) so make your way over in the morning and avoid the afternoon crowds. Allow plenty of time to wander the walls, as you'll undoubtedly want to stop and savour the sparkling seas and city sights that sprawl out before you. Take a ride on the wild side and catch the cable car to the top of Mount Srđ. From here find your perfect perch and sit and watch as the world goes by beneath you. Boasting beautiful views over Old Town, out to the Elaphiti islands and beyond, this is a good place to get snap happy! One thing's for sure, when it comes to holidaying in this Mediterranean marvel there's no shortage of things to see and do. Including the coveted Dubrovnik Summer Festival, a tradition that first kicked off in 1950 and is still going strong today! Over 80 performances of music, theatre and dance take place all over Old Town, as well as a series of outdoor cinema showings. Whatever time you choose to visit the walled wonder over the summer, it's likely you'll be able to catch at least some of the fantastic festival. Bask in beautiful 30°C highs as Dubrovnik enjoys the hottest months of the year. There's not really a bad time to visit the sun-blessed shores of Spain, but if you like sizzling temperatures in all their golden glory, then a summer getaway might be just what the doctor ordered. Sand, sea, sangria and siestas are all in strong supply, so indulge your inner beach bum and jet off to the magical home of fiesta and flamenco! Outdoor enthusiasts will find all the heavenly hallmarks of an adventure holiday. Desert landscapes, mesmerising mountains, craggy coastlines and captivating caves are all waiting to be explored. From Andalucia's Sierra Nevada Mountains to Lanzarote's otherworldly Timanfaya National Park, there's a whole host of unique scenes to feast your eyes on, and of course activities to match! Saddle up and try your hand at horse riding, canyoning, watersports and hiking (to mention a few). Outright sun worshippers will flock to the Blue Flag beaches that line Spain's shores. Between the Balearics, Canaries and Costas there's no shortage of sand stretches to set up camp. In fact, over 5,000 miles of collective coastline means you're guaranteed to find your own slice of beach paradise. It's all frolics and family fun at Mallorca's Puerto Pollensa, whilst Costa Blanca is renowned for its buzzing nightlife. Whichever dreamy destination in Spain catches your eye, there's plenty of showstopping holiday options for your 2020 summer getaway! Of course there's plenty more where those came from… with over 3000 holiday villas across 60 dreamy destinations – you're sure to find the one that'll spark your wanderlust! 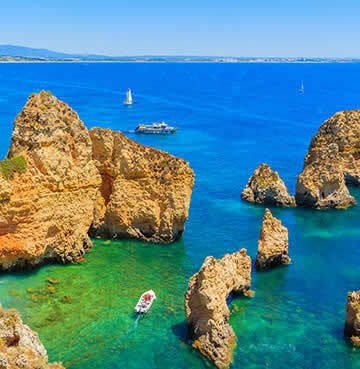 Treat the kids to a week or two on the golden beaches of the Algarve. Summer is the perfect time for splash happy shenanigans, and with more than 100 miles of shores to explore, you don't even have to visit the same spot twice. Swap wet and wild Atlantic watersports for the thrills and spills of out-of-this-world Orlando. Magic is most definitely in the balmy Floridian air, with bright lights and colourful parades aplenty. Rub shoulders with the world's most famous mouse and get your heart-racing on theme park rollercoasters. Every child's dream come to life – the look on their little faces will be priceless! If your tastes are a little more refined, why not indulge your foodie fixation and eat your way across Italy? From the Amalfi Coast and its sumptuous seafood dishes, to Tuscany's mouthwatering medley of local flavours. Treat your taste buds to the trip of a lifetime and experience a menu as diverse as the country that created it.